Ahoy there me hearties! It’s me again yer favorite app pirate ready to for another awesome adventure around the seven seas. We were on a week break and the entire crew is now excited to go on more booty hunting expeditions and bring home more finds! But ‘afore we sail, of course me won’t leave ye empty handed. This old salt has prepared an app review just for ye lads and lasses. 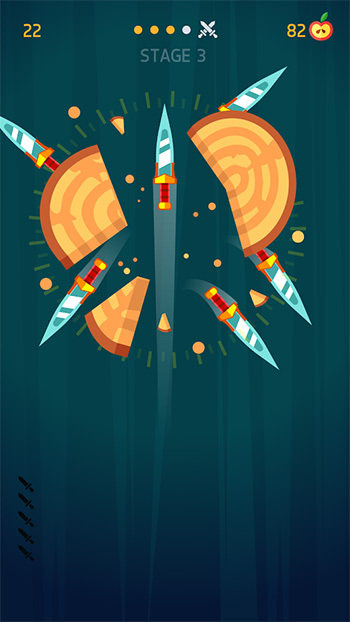 Avast ye as we begin learning more about Knife Hit by Ketchapp. At first glance, the graphics of the game will not really wow you. You’ll see a round brown and yellow log with apples and knives and little knives on the lower right that determines how many knives you still need to strike on the log. On top of the window are the stage and your score. The background is a mix of green and black. The boss levels are those that have fantastic graphics. The log turns into various objects that include donut, camera, and doll. These objects are fun to look at and they vary, which gives excitement to the game. The difficulty level increases as the stage goes up another notch. While they become more challenging, they are still not impossible to complete. Moreover, unlike other games that have similar gameplay, you will not feel forced to make in-app purchase in order to pass the levels. You can pass them using your own skills. Knife Hit can be downloaded for free. It may come with in-app purchase, but as mentioned, you will not feel forced to get them and spend real cash. While this is a fun and enjoyable game, the advertisements can be annoying. You may be forced to watch a video advertisement before you can continue with the game. While many free games earn through ads, it would have been better if they are placed strategically so they do not affect the game experience. The game lets you play as much as you want. While it has the same goal on all the levels, you will not feel easily bored because of the challenge that it brings and the different log designs that you will on the boss stages. This is a fun time waster that will keep you entertained. It’s perfect for breaks or long down time. Knife Hit is free to download. It has adorable graphics, especially in the boss stages. The levels are challenging but they are not impossible to solve. It’s fun and it will keep you occupied. You will also not easily feel bored. The only drawback that we see on this app is the advertisements that can sometimes affect the overall gameplay as they disrupt the game. 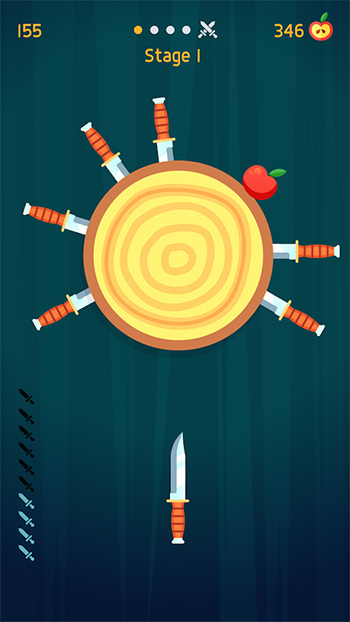 Knife Hit is highly recommended if you are looking for a casual free app that is fun and challenging. Prepare yourself for lots of ads, but other than that, you are more likely to enjoy playing this game.